kaseri, i must say: your platter is simply breathtaking and most certainly made me go “ooh”. i’m wondering how your midwestern guests took to the cheeses… was there a crowd favorite? did they polish off the platter or did they experience fromage-fatigue? do you think any of them will take these fromage-tasting practices back with them to the midwest? if so, there may be hope for this nation after all! and i’m of course intrigued by the sagey cheese… an intrigue that is quickly developing into a full-fledged obsession. 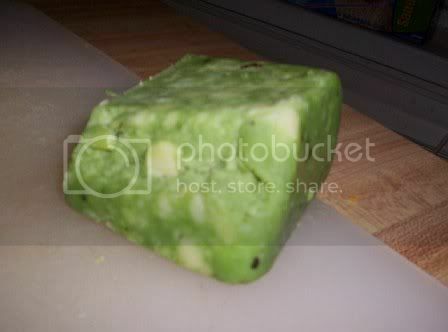 i am now dedicated to the sole task of finding this green cheese and tasting it. thanks for the post and welcome aboard! The relatives ate all the cheese but avoided the sage varietal, which meant more for me! One encouraging sign for our future is they were intrigued by the gruyere. If you've never had it, it's a type of swiss that is great for cooking - I use it in stuffed mushrooms and my mom does this great dish of a puffed pastry stuffed with crushed pear and gruyere - yum! I haven't yet served the 'cheese platter' myself, but this is a good motivator Kaseri, thank you. I've also tried Sage once, at Whole Foods in Arlington. It is an interesting cheese that demands an acquired taste. It's taste distinct if I remember and I did not like it immediately on the palate. I suppose its reward when it sits in your mouth for a while. I think it should be used to augment a serving of a number of other distinct cheeses, because there is no real fear of taste-overlap. 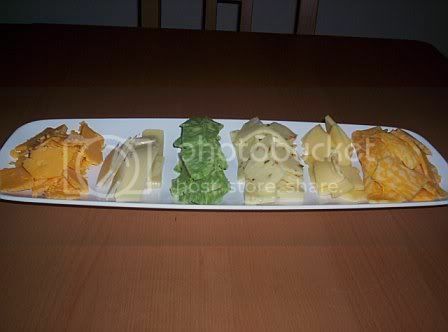 the green cheese looks awesome! now I'm hungry. Definitely a nice looking platter, kaseri! For christmas time get-togethers we will pair it with a port-soaked cheddar which has a great marbled-red color, for a festive looking plate.